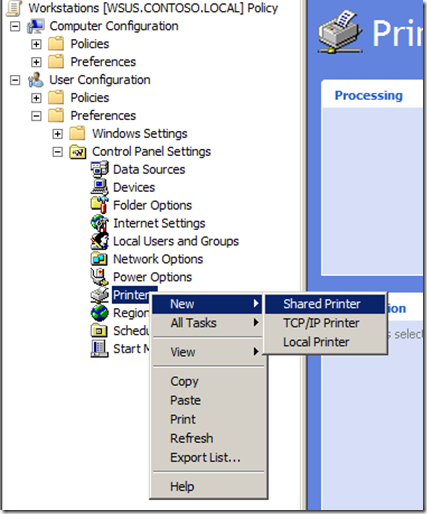 This week I have selected the “Shared Printer” Group Policy Preference as my Group Policy Setting of the Week (GPSW). This is arguably one of the most wanted group policy settings by Group Policy admin’s that was missing before group policy preferences. It was possible previous to preferences to map printers natively in group policy using the pushprinterconnections.exe option but like the Star Trek Deep Space Nine episode “Trials and Tribble-ations” we defiantly “do not discuss it with outsiders” as this is just a setting we would rather forget. The “Shared Printer” options can be found under by right clicking on “User Configuration > Preferences > Control Panel Settings > Printers”. As with most group policy preference settings you also have the option to CRUD (see Group Policy Preferences Colorful and Mysteriously Powerful Just Like Windows 7) which means you can also use this option to remove any printer mapping that people have to printer queues that no longer exist. Now it has always been fairly straight forward to map printers via logon script either via batch, vbscript or even kix scrtip however the real power of this setting is that it can now take advantage of the really powerful targeting options. More commonly you can map a printer via a single security group or IP range but you can really start to do some really advance targeting when you start to combine multiple targeting setting using Boolean logic. If you want to see some more advanced targeting options for printer mappings then check out my “How to use Group Policy Preference to dynamically map printers when using Roaming Profiles” article. As you can see above you can also use this option to set the default printer for your users which can be very handy if people have a habit of always printing to the really expensive A3 colour printer on your floor when you are trying to reduce cost. Just use the default printer option wisely however as you could end up annoying your manager who likes to printer to their locally attached printer. Enjoy!